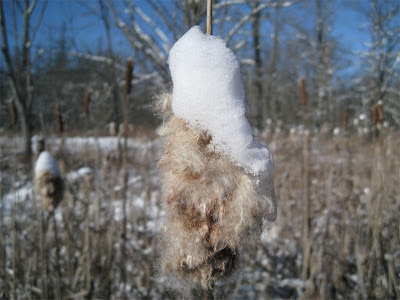 For a quick winter hiking fix, I visited Kensington Metropark a few weeks ago to spend the afternoon walking a few of the park's quiet nature trails. We had received a good amount of snow earlier that week, and temperatures in the teens ensured it lasted through the weekend when I could get out and enjoy it. 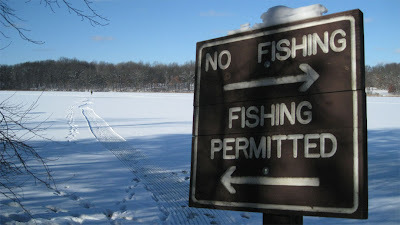 When I reached the parking area near the nature center, I decided to leave my snowshoes in the car. 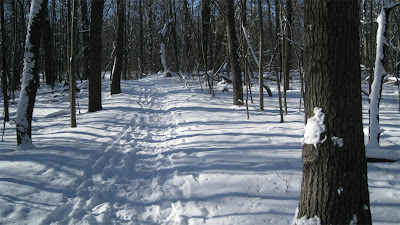 There were many people taking advantage of the freezing but sunny day, so the trails were trampled to the point where snowshoes were not necessary; however, Yaktrax might have made walking a bit easier. First I headed out onto Aspen Trail. I passed a few photographers out trying to get shots of birds against the snowy background of the trail and powdered trees. 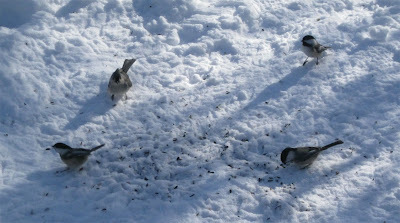 Chickadees ate seeds out of a man's hand, while his female companion took photos with her massive camera. I saw surprisingly little wildlife that afternoon, but this could be due to the number of people out. The trails were by no means crowded, but I saw considerably more people on this cold day than any of the times I visited the nature trails during the summer. After finishing the Aspen Trail, I continued on Wildwing Trail which circles Wildwing Lake. 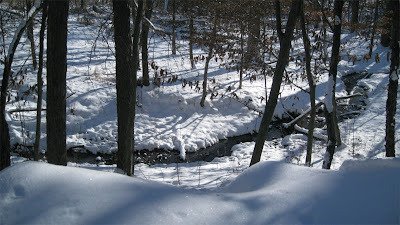 It was interesting to observe many parts of these trails without the thick green foliage typical of the warmer months. Wildwing Lake was a bit boring without all the birds that call it home at other times of the year, however. Ice fishing was getting underway and I could see a few people setting up shop out on the ice. By now, most of the snow we received earlier this month has melted, which is typical of this part of Michigan. I plan to head up north in a few weeks for real winter conditions and for the opportunity to get my snowshoes out of the car. FIRST OF THE NEW YEAR !!!! good to see you back here !!! pour a cuppa the black !!!! thanks for taking us along on the day trip. such lovely photographs. the long shadows. very nice. You don't have to be envious. Colorado awaits you!!! Scientists have been studying the interdependence of wolves and moose at Michigan’s Isle Royale National Park for half a century. It is the longest continuous predator-prey study ever conducted. Anchored in the northwest depths of Lake Superior, Isle Royale is one of America’s last remaining wild places. Filmmaker George Desort spent over four years exploring this wilderness island with wolf biologists Rolf Peterson and John Vucetich, as they attempted to make sense of the delicate balance between wolf, moose and climate. Desort's documentary film, Fortunate Wilderness: the Wolf and Moose Study of Isle Royale, will air on WNMU Channel 13 Marquette at 9 p.m., Sunday, Jan. 31, and at 1 p.m., Monday, Feb. 1. Michigan Tech helped sponsor the airing of this film on Public Broadcasting stations in Michigan and across the nation. The film is also scheduled to air on KQED in San Francisco at 9 a.m. and noon on Friday, Feb. 5, and on Milwaukee Public Television at 9 a.m., Sunday, Feb. 21. Awesome stuff! I was a Michigander until May. That's when we moved to the Middle of Nowhere, Iowa. Yeah, the economy. We hope to return to the Great Lakes one day. Thanks for the comment and info. This documentary hasn't aired on PBS in my neck of the urban sprawl that I know of, so I've been thinking about ordering the DVD. Also, thank you for the KeweenawNOW URL. I'm looking forward to reading! you are welcome, Nina, should have included all of the URLs below for you and your blog readers. my bad. better late than never. KALAMAZOO — During a tour of Belgium last February with his daughter Laura, Bell's Brewery president Larry Bell visited an exhibit in Bruges of Spanish surrealist painter Salvador Dali. The art — specifically, 1931's "The Persistence of Memory" — inspired Bell enough to make it the central theme of this year's Oberon mini-keg design. For the last two years, the mini-keg featured a beach or lake scene. This year, it's Dali for the craft brewery's flagship brand, the popular wheat ale Oberon. The five-litre cans are made in Germany and shipped to Kalamazoo to be filled. Bell said he expects the cans to be in stores by mid-May, in time for the Memorial Day weekend. The price will most likely be around $20 per can. Bell also said the Dali-inspired image was changed enough that the Bell's ad agency said it did not violate any copyright laws. In other Oberon news, Bell said the official opening day will be March 29.
have you been following the Pure Michigan Photoclub Photostream ??? thought you might enjoy as you are also quite handy with the camera. if you should ever head west on Interstate 94 ( I - 94 ) here is a triangle shaped ( on a map ) tour of southwest michigan craft breweries tour. happy beers and ales to all !! The 5th Annual Winter Beer Festival will take place Saturday, 27 February 2010 at the Fifth Third Ballpark in Comstock Park, just north of Grand Rapids. The Winter Festival is a unique opportunity to sample some of the best beers in the world, all brewed in Michigan. The organizers are expecting more than 35 Michigan microbreweries and brewpubs to participate and there will be more than 200 different beers available to sample. The event is open from 12:00Noon to 5:00pm. The Festival will take place in the outfield parking lot at the ballpark this year and breweries will be located within several large tents. The tents, combined with body heat will help take the edge off the temperature, but please recognize that the Festival is an outdoor event and dress accordingly. Hats, mittens, boots and long-johns are recommended to keep you warm. I'm actually from the west side of the state (Kalamazoo), and would love to move back there (or north, of course). Regarding Sweetwater Visions, I linked to their Isle Royale photos on my final Isle Royale trip report entry. Amazing stuff!